Valtteri Bottas admitted he foresaw his bad start from pole in Formula 1’s Chinese Grand Prix. The Mercedes driver blamed the white line just in front of pole position at Shanghai for triggering the wheelspin that contributed to his Mercedes team-mate Lewis Hamilton snatching the lead from second on the grid. 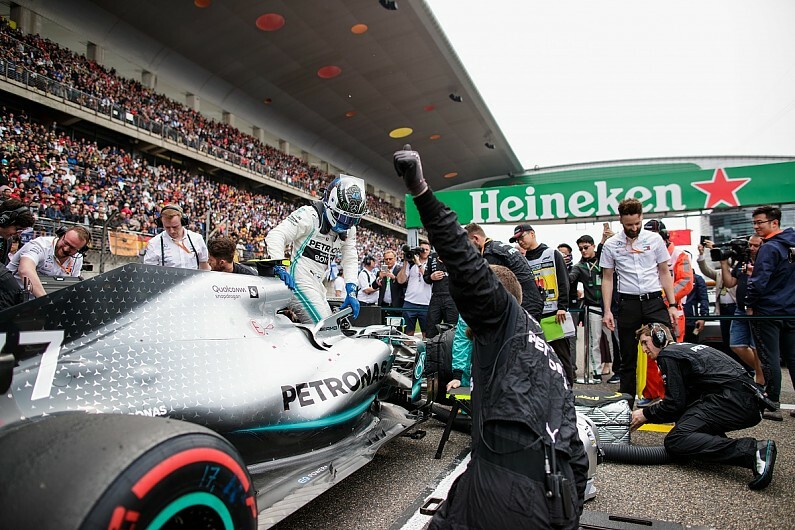 Hamilton went on to head in a Mercedes one-two and depose his team-mate from the top of the championship standings. Bottas said he realised the white line might be problematic on the formation lap but it was too late to do anything about it. “I thought it was going to be fine because I’d never had that issue before, so on the formation lap I made the normal start practice. Then I saw it could be an issue. “I thought maybe with warm tyres it’s going to be OK, but it wasn’t. That’s life. Bottas’s Chinese GP pole was his seventh in F1, and he said he was learning how much the startlines vary and what impact it can have. “I got wheelspin from the white line in front of my box,” he said. “A couple of metres before that it was fine, then the big kick of the wheelspin and I lost a few metres of distance to Turn 1. “I think it’s only at a few tracks that it’s such a thick white line. And maybe the paint changes also from one track to another. Bottas felt he had little chance of getting back in front during the race once behind. “Especially in the first stint with the medium compound, there was quite a bit of tyre overheating, so even being three or four seconds behind you’re sliding more, which overheats the tyres more, and then it’s more difficult,” he said. “But that’s how F1 has been for a long time, so whoever is in the lead can control it a little bit and always has it easier in a way.